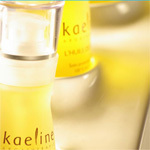 Kaeline simply gives you the best of Nature. Complete skincare and haircare, argatherapy associates the exceptional argane oil properties along with aromatic essential oils powers. Oil with unic and complete virtues, the argan oil is made up of 80% unsaturated fats and has extraordinary biological activities thanks to its richness in vitamin E - 3 times more than in any other natural oil.